Just thinking about what has to happen behind the scenes to pull off a successful event, television or theater production would make anyone break out in a sweat. But John Trowbridge, founder of Wolf Productions, manages to always stay cool. Whether he is helping light politicians, working on concert productions for rock stars, or making sure the ball drops precisely at midnight in Times Square, this veteran of the industry has got things covered. What is the coolest project you have ever worked on? It’s hard to pick one. The more interesting projects tend to be the ones where I don’t have a whole lot of time to pull things together or we are dealing with brand new technology. It is of course always fun to work with different celebrities, political figures or corporate CEO’s too. The most interesting thing really is the variety. It’s not like going to the same office every day and doing the same thing. Yes, I’m doing the same job every day, but I’m working in different venues, on different types of shows. 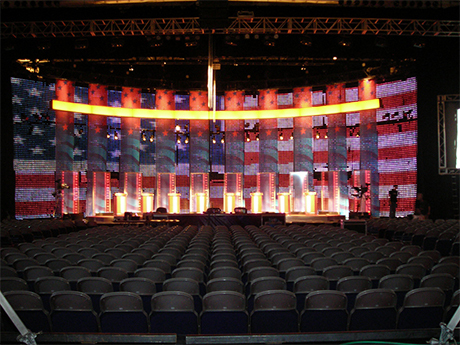 Whether it’s a corporate business meeting, a tradeshow, a concert, lighting political figures, every day is different and that certainly keeps things interesting. You are responsible for making sure the Times Square ball drops for New Year’s. How stressful is that? It’s certainly stressful. I’ve got a great crew and we’ve all been doing it for a few years so we know what’s involved. We make sure that any issues that could arise we address early on to make sure that everything is going to go perfectly the night of. I will say that I drink a lot of coffee that day and I’m certainly glad when 12:01 comes around. So does the crew go home and go to bed or go party and join everyone else? I think we all do different things. Many of the crew members go home to their families. I like to go out and have a couple drinks; it certainly takes me a while to unwind. It’s a long day for us because we start at 4:00 am to work with a couple of the morning television shows – they show up at a ridiculous hour and start setting up so they can go on air at 6:00 am. By the time midnight comes around, we’re certainly tired, but with the energy and the stress, going home and right to bed is never going to happen for me. Do you get to watch it or are you inside the tower? I’m actually on the roof. There’s a lot of pyro that goes off as well so you can’t just stand there and watch the whole thing because you have to take cover. But I’m on the roof and making sure that everything’s fine. The guy that actually hits the button is downstairs in the building and we’ve rehearsed it dozens of times every year so we know everything going to be perfect. You work with lighting and electricity every day… any good stories there? No, knock on wood, I haven’t really been electrocuted. Every once and a while something might happen because of bad equipment, but never anything catastrophic. All the equipment that I use is from various rental houses and they regularly check their equipment so things like that don’t happen. When you pay more and deal with professionals, you avoid those issues. No one’s ever gotten hurt on projects that I’ve been on and I plan to keep it that way. Nine Inch Nails… how cool was that and what was the project like? That was very cool! They were one of the bands that was on my bucket list and when I got the call to do four shows in New York, I was certainly excited. Trent Reznor played three different clubs in four nights. Given that it was a club setting as opposed to an arena, the scale of the lighting show was much smaller. It was great seeing him in such a small environment. You talk about how things change on a daily basis and it’s never the same, but are their certain components of a project that you really like? I like being organized and having some advanced time to get there. There is nothing like when the show goes on, the lights turn on, everything works, the show looks great and the audience enjoys the event. You’ve been in this for a while, are there other things that you have seen change in the industry that have been pretty dramatic? I think the process has stayed the same. With the advent of computers and Cad Software, you can design shows faster and communicate them to everyone who needs to be looped in faster and better. But this also leads to the last minute changes and it’s a lot easier for people to change their mind, i.e. “oh we’ll just move the stage five feet.” Now to redistribute drawings, all you have to do is put a link in Dropbox or email and they never have to leave their desk. Back in the day they had to go to the blue printer and print out blueprints and package them in FED EX envelopes and ship them out to every department. So it can lead people to not commit, not think through things fully and to change their minds. Technology changes, everything’s on computers now which makes for much more elaborate shows and much more dramatic shows which I think is good. So what about your free time? Do you have free time? Sure, absolutely. I’ve been running a lot lately, not really training for much of anything, just enjoy getting outside and running. I like hiking. Cycling. Going to the movies. Hanging out with friends. Any good stories where, “you’re on the hot seat,” you have to think quickly and make something happen? That stuff is sort of day to day. 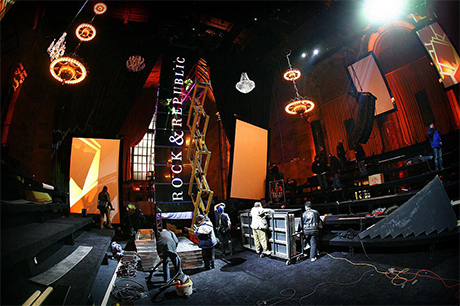 We did a fashion show for a manufacturer called Rock & Republic and we literally had less than 24 hours to load an entire show in a very nice, very elaborate venue with a lot of integrated rigging. And figuring how to load it in, how to make the system work and allow other departments to have the floor space, because the people that have to come in to build the seating and the runway-need time to do their thing, so we have to do our thing quick. That was fun and certainly a big challenge. The ball has been dropped in Times Square since 1907 (yes, over 100 years – talk about pressure). 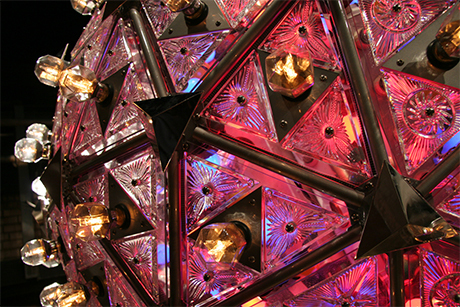 The ball in Times Square has the ability to produce over 16 million colors and billions of patterns (yup we said billions) – making it look like a kaleidoscope. In addition to the ball that drops on New Year’s, there is also a permanent ball that is on display year-round; so Times Square has two balls. In 2007 the ball was updated to replace halogen and incandescent bulbs with LED ones (you could say the ball keeps its cool too). The average temperature in New York on New Year’s Eve is 32-38 degrees which should help keep people from working up a sweat.